The time has come for you to look for a job, Or maybe the parents have surprised you with a urine drug test. Whatever the reason is, you must to act quickly if you want to pass a urine test on short notice. Although fooling the system can be very difficult if you don’t know what you are doing, passing a urine test isn’t all that difficult if you have the right information and time. This article will give you all the information you need about drug testing and ways to get marijuana out of your system faster. A urine drug test (UDT) is a widely used and most common way to test for opioids and illicit drugs including marijuana. There are two types of a urine drug test, a screen test and a confirmatory test. The screening test uses an immunoassay to look for the parent drug and/or metabolite. Most drug tests screen for marijuana, cocaine, opiates, PCP, amphetamines, while some also test for benzodiazepines and methadone. The confirmatory urine drug test is done by gas Chromatography/mass spectrometry (GC/MS) or high-performance liquid chromatography (HPLC); this test is highly specific and is typically used when drug testing for the presence of a specific drug is needed. 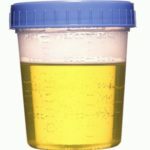 When an employer requests a urine drug test from an employee, or a physician requests a drug test from a patient, the employee or patient is typically instructed to go to a collection site or is given a sample cup on the spot. The urine sample goes through a specified ‘chain of custody’ to ensure that it is not tampered with or invalidated through lab or employee error. The patient or employee’s urine is collected at a remote location in a specially designed secure cup, sealed with tamper-resistant tape, and sent to a testing laboratory to be screened for drugs (typically the Substance Abuse and Mental Health Services Administration 5 panel). The first step at the testing site is to split the urine into two aliquots. One aliquot is first screened for drugs using an analyzer that performs immunoassay as the initial screen. 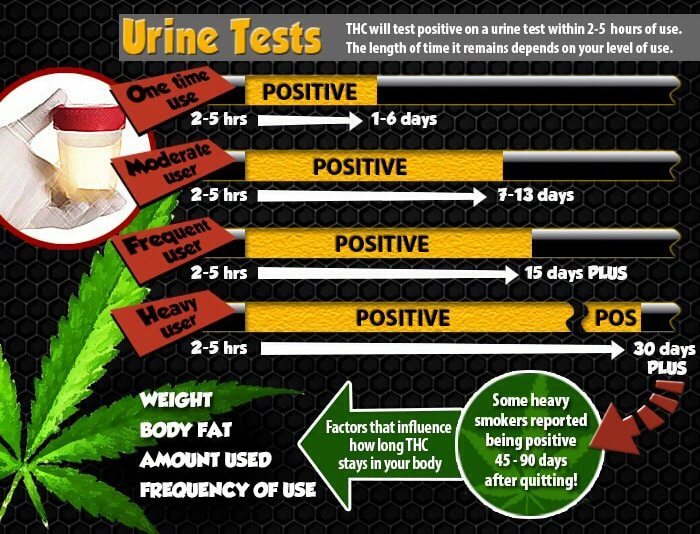 How long do urine drug tests detect marijuana? There is no simple answer to this question. Detection time depends strongly on the kind and sensitivity of the test employed; the frequency, dosage, and last time of use; the individual subject’s genetic makeup, the state of one’s metabolism, digestive and excretory systems; and other random, unknown factors. Pro Tip: Taking marijuana detox pills can significantly reduce the time that you will test positive. Drug testing technology has advanced significantly over the years. Drug Testing is at the point now, where most methods such as salt and fake pee are not guaranteed to help you pass. Some drug testing facilities have policies to test for everyday household products that are thought to help mask illicit drugs such as salt and bleach. Synthetic urine may seem like the best shot at passing a drug test but can be detectable if it does not contain uric acid. The best way to prepare for a drug test, is to stop using all together as far in advance of the test as possible. However, urine drug tests can take you by surprise. When they do, there are a few ways to help increase the chances of passing. If you know the date or even just the week the urine test will be conducted in there are a few ways you can help prepare your body by helping it eliminate drug metabolites. 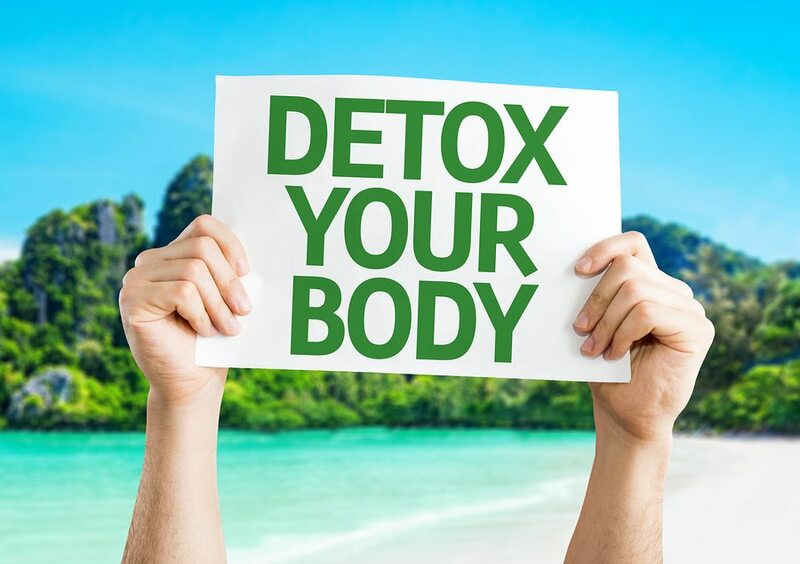 Take advantage of as much time as you possible can to detox your body. Each day after your last use of a drug, the concentration of its metabolites becomes less and less. Stop using as soon as you know you will be subjected to a urinalysis. If the urinalysis is being administered by your employer, the chances are that you will have some kind of advance warning. Thought he date may be unknown, the week the test will be administered should be common knowledge. Make sure you are aware of your company’s drug testing policy, to keep it from sneaking up you. If the urinalysis is being conducted because you are on probation, your tests are likely on a set schedule. Knowing your drug testing schedule is key to being able to pass your tests. Make sure to detox your body beforehand. Attempt to calculate the amount of drug metabolites in your system. 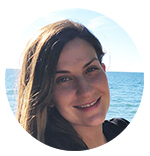 Chronic drug users will fail a drug test every time. However, if you only use on occasion, there are several ways to flush the drugs toxins from your body. 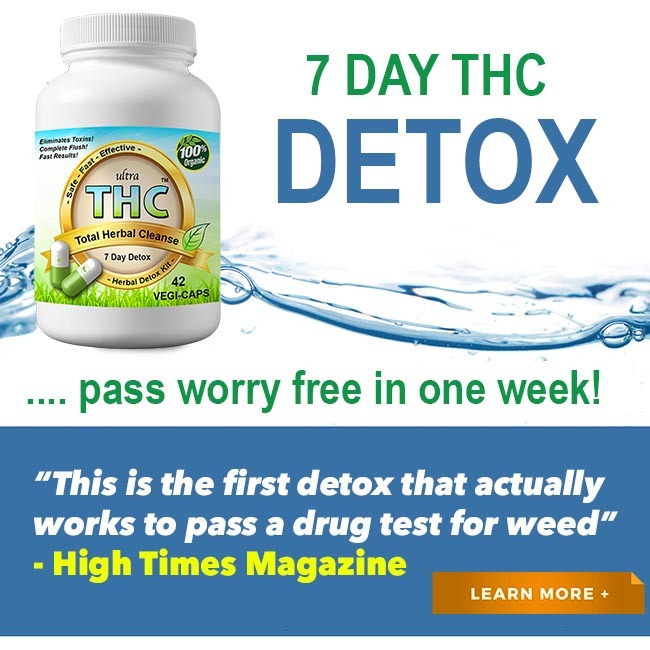 If you have a decent advance notice of the drug test, try using our 7 Day Ultra THC Detox kit. It has given proven results to thousands of people. Sometimes a drug test will pop up unexpectedly with little or no time to prepare. Even though these tests are difficult to pass, there are a few things that can be done to increase your chances of passing. There are many important things to remember when attempting to pass a urinalysis on short notice. Most household products that have been used in the past as a way to hide the traces of drugs in your urine, such as bleach, salt, and vinegar, will alter the pH level of your urine. This makes it obvious that the sample has been tampered with. Using water to dilute the sample can cause the color and temperature of your urine to change. Clear and lukewarm urine will be rejected by most testing technicians. Do not drink bleach to purify your urine. The myth is that it will mask the drug metabolites in your urine. The reality is that it will result in corrosion of the mouth, throat and stomach and even death. The worst part is, that it will not even mask the drugs that can be found in your urine. Don’t use products that claim to mask the drug metabolites in your system if you add the product to your urine. These typically will not work. 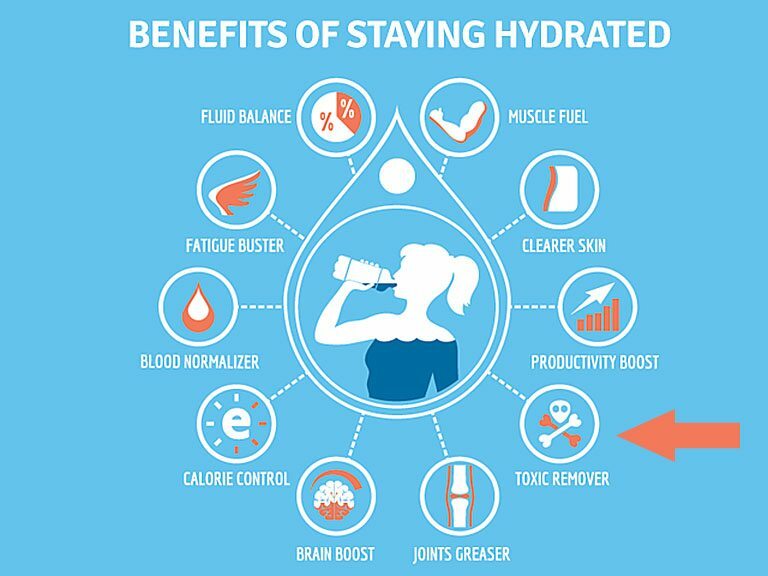 One thing that can help if you are not a chronic drug user, is to drink lots of water beginning the day before the test. This allows you to dilute the urine sample somewhat before it even leaves your body. Take Vitamin B pills the day before your test to make sure your urine maintains its yellow color. The testers will be suspicious if you provide a clear urine sample that has been diluted from drinking too much water. Empty your bladder as often as you can before the test. Urinating frequently will help your body eliminate the drug metabolites that are lingering in your system. You can boost your urine output by employing the use of diuretics such as tea, coffee, and cranberry juice. Because drug metabolites build up and become more concentrated as you sleep, the urine from your first urination will contain a higher concentration of the drug than later streams. Make sure to urinate before taking the test and drink lots of water to help dilute it. If you are not being observed as you take your test, make sure to urinate into the toilet first and then into the cup before submitting your sample. The concentration of drug metabolites will be higher in the toilet than the cup. Weigh the option of substituting clean or synthetic urine for your own when taking the urinalysis. This option should used as a last resort only. It is difficult to pull off and the penalties if caught might be worse than the penalties of just testing positive. The clean or synthetic sample must be maintained at the proper temperature to pass the urinalysis. Also consider the difficulties of being able to sneak the sample into the testing area. Kits that include the synthetic urine and the equipment to maintain the proper temperature are sold online and at smoke shops. Fake urine will pass most drug tests, but some states have instituted a policy to test for uric acid. Make sure it is an ingredient before trying to use it. Using a urine sample of another donor can be even more difficult as you never know what will show up in the sample. Drug stores and smoke shops sell testing strips for testing urine. You’ll want to know what it is the donor sample before using it. 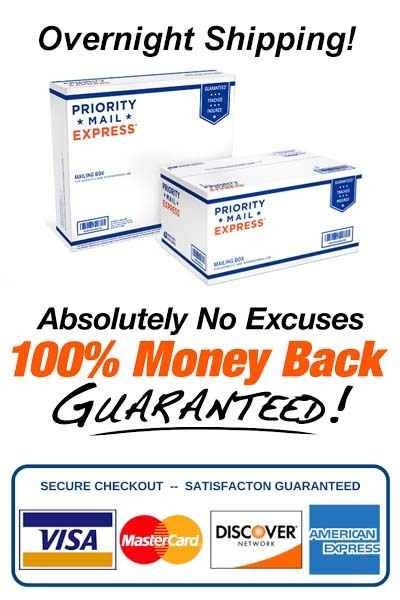 How Can You Pass A Urine Test In 7 Days Guaranteed? The best way to pass a urine drug test on short notice is to detox the body completely. This speeds up the process 10 fold and helps eliminate all marijuana toxins from the body. 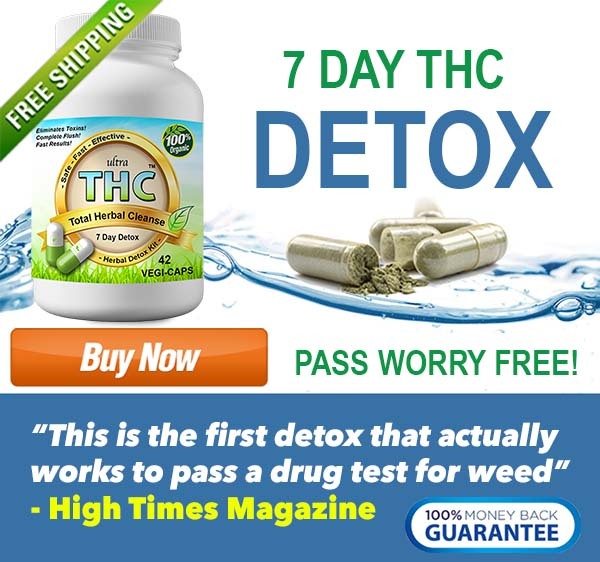 Our product Ultra THC Magic Detox™ was developed to eliminate all THC toxins in just a week. 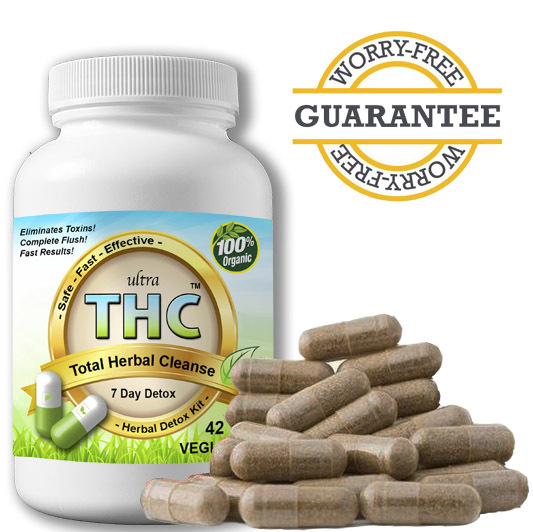 Its natural cleansing herbs strip THC from fat cells and the body to permanently flush your system so you can pass guaranteed! Permanently Cleanses After 7 Days! 2019 Guide: What Companies Drug Test Employees?